Is Roy high school Haunted? Roy high school was built in 1965. It became Weber County's largest high school at the time and was later rated as one of the ten best in the nation. 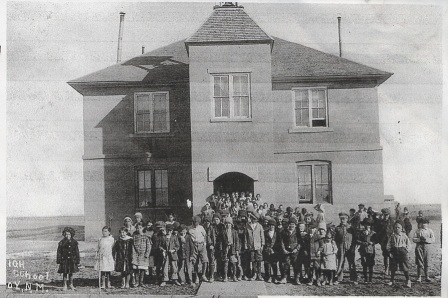 Prior to the establishment of Hill Air Force Base in 1940, the city of Roy had only one school that housed students of all ages. In 1943, that schoolhouse reached capacity and high school students were bused across Ogden to the north end of Washington Boulevard, this went on until the high school was built. The first ghost is of a girl by the name of Mable. No one knows how she died but she stays in the large auditorium around back stage, and the winding stairs area. she is known to often play tricks on people by turning lights off or on, moving props, making props disappear, scaring people, and making her presence known. The second ghost is a lady who's often seen in a purple hat. She tries to get people to follow her but no one will since she gives off an eerie and evil aura. The next ghost roams the entire school but mostly the halls. When the school has hardly anyone in there or someone is walking alone, people have reported that they feel as if someone is glaring at them. It is thought that this ghost was created by being hit by a train while he was alive. Roy high school to haunted places in Utah. Return to all haunted places.